Summers are here and with the scorching heat come the stressful times for children who are all set to appear in their final set of exams. Parents also get nervous and are engulfed in the exam tensions. For any student, it is good to have nominal stress, as it helps them in being focused and work hard. However, as this quote rightly says – ‘Excess in everything is bad’, high levels of stress prove to be a bane and directly affects the performance of students, due to which they may not get desired results. Parents want their children to be diligent in their studies. But if they constantly follow the pattern of eat-sleep-study-repeat, then it is not considered healthy, which in turn can affect their performance. So, it is very important for parents to encourage their children to take a break and exercise for a short time daily, especially during exams because it acts as the stress reliever and keeps them fresh and ready for their studies every time. Revisions are must for children to perform well in exams, and more the time they get to utilize, the more they will be able to revise. Therefore, during exam time if the chores are left undone or the bedrooms are messy, then it is advisable for parents to let such things go off, as it will help children with time to focus on their studies. Parents must encourage their children to talk about exams, preparation and any stress that is affecting them. This can help them realize that having exam nervousness is completely normal. Parents should also remind children about their capabilities, their past success and give them confidence to overcome any exam anxiety. It is easy to get into a habit of cramming as much syllabus as possible. Some students utilize most of their hours in revising the course, which is not advisable. To be able to perform to the best of their abilities, students must look after themselves, along with focusing on their studies. Therefore, they must develop a habit of sleeping well, eating healthy and getting regular exercise. A fresh mind always helps a student to study well. Therefore, it is advisable for them to set time aside in their study schedule for some fun and relaxation, either listening to music, playing games or watching favorite TV shows. However, they need to be disciplined and follow strict pattern of maintaining a healthy balance of studies and relaxation activities. Some degree of exam stress is natural. Each student needs to realize that he or she is not alone in this whole process. They must take examinations normally as it is just one of the steps in their academic journey. Students should understand that it is ok if they do not get the desired results in particular subject or exams. They will always have another chance to do better in future. 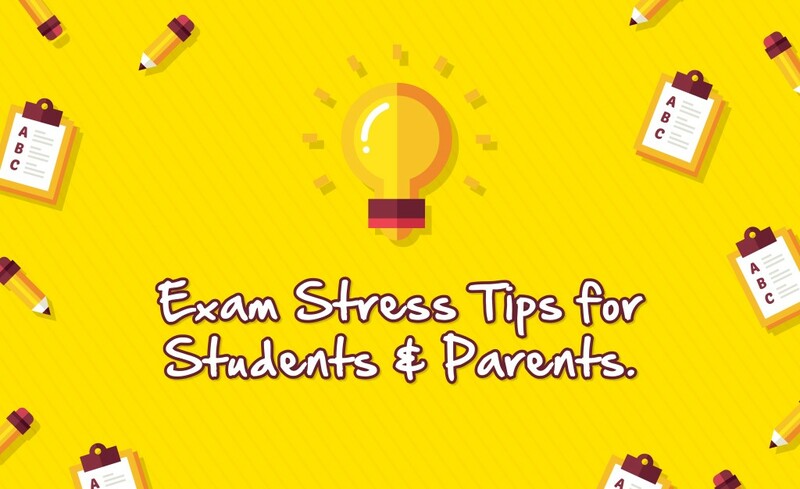 Apart from these, there are a several other ways to beat the exam stress such as finding a good place at home to study, focusing on important topics, reviewing past exam papers, eating nutritious & balanced food, etc. If parents and students alike stringently follow these tips, then they will experience an improvement in their studies and get desired results. UCMAS, with the help of its whole-brain development program, lays a strong foundation of cognitive skills in children. The program not only improves math skills but also develops soft skills like confidence, concentration, memory power & multi-tasking. With enhanced skills, children are able to face the exams without much stress and perform well.